November 19, 2009 – This is what college football is all about! A heated rivalry for local bragging rights, and a trophy to display to the alumni and potential recruits. Thursday night, November 19, Southeastern Louisiana University and Nicholls State meet in Hammond to see who will lay claim to this year’s River Bell Classic. “The big game tradition,” said Southeastern Head Coach Mike Lucas. “Coach [Jay] Thomas has his team playing really well; they are going to come in fired up.” Southeastern saw their chances for a Southland Conference championship end last Saturday in a lost to Stephen F. Austin, but a victory will secure the Lions best season since the return of the program after an 18 year hiatus. “Possibility of finish second in the conference, “said Lucas.” We only lost to the two co-champions.” With a victory the Lions will match their most wins in a season since the return of the program. The 2004 team when 7-4, but played a weaker schedule. This year’s squad enters the game with a 6-4 record and has already notched its first ever winning record in Southland Conference play. The Lions 4-2 conference record is impressive considering the Lions won only 3 conference games their first two years in the SLC (2005-06) and didn’t win their first conference road game until last season. The Lions entered last weekend’s game against Stephen F. Austin tied for first place. This year’s game is also the last for 10 Lions seniors who have been instrumental in the rise of the program from a 2-9 record back in 2006. “This group has helped us step through a new threshold,” said Lucas. “They have taken us to the next level.” Merrick Lanaux, a senior wide receiver from Hammond sees is as an “emotional night”. Among the players with Louisiana connections, a trio will finish highly successful Southeastern careers. St. Amant High School’s Brian Babin, the Lions starting quarterback, is on pace to finish his career as the second leading passing yardage leader in Southeastern history. He will also finish with a top 20 national ranking in several passing categories. Despite battling injuries most of his career, Lanaux will finish in the top 10 in catches and receiving yards in Southeastern’s records. Quinten Pierre, from New Iberia, a starting linebacker, was a 2008 All-Southland Conference Honorable Mention performer. In last year’s show down against Nicholls State he returned a fumble for a touchdown. 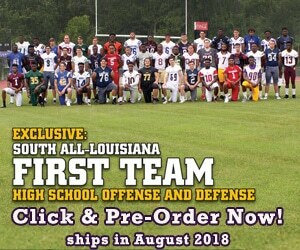 Another Louisiana senior, Tommy Connor from Archbishop Shaw in Marrero, has received a medical red shirt after injuring his hand earlier in the season. Connors was a pre-season All-American selection. The game is for the River Bell Trophy, which has been awarded to the winner since the 1970s. Nicholls State won the 1985 contest and kept possession of the trophy while the SLU program was on hiatus till 2003. The series resumed in 2005 with Nicholls winning 3 for the 4 games. SLU won the trophy for the first time since the series returned in 2007. Back in the 1970s, when the Southeastern and Nicholls rivalry was at its height, the contest was played in the Louisiana Superdome in New Orleans for three years (1975-1976, 1978) before 20,000 in attendance for the 1975 and 1976 games. Nicholls State holds a slight edge in the all-time series, winning 10 of the 18 games. Last year Nicholls defeated Southeastern 35-28, holding off a furious Lions 4th quarter rally. The Colonels led 35-7 with 14 minutes to play before the Lions struck for three late touchdowns. In 2007, the last time the game was played in Hammond, the Lions rallied from a 13-0 deficit to win 17-13, capturing the River Bell Trophy for the first time since 1980. This year’s game kicks off at 6 p.m. in Strawberry Stadium on the Southeastern campus. The contest is the Southland Conference Game of the Week.